When the weather is nice, it’s good to go out and get some fresh air. It is even better when you can do it with your pet. They don’t get out of the house much, except to go to the bathroom or play a little bit, but mostly they’re confined to inside the house. Sometimes, though, a walk with your pet on a leash isn’t the best option. They may be small and have to run to keep up with you, and most of the time you’ll have to carry them home. You also have to watch carefully for other dogs and be ready for when yours sees another animal. 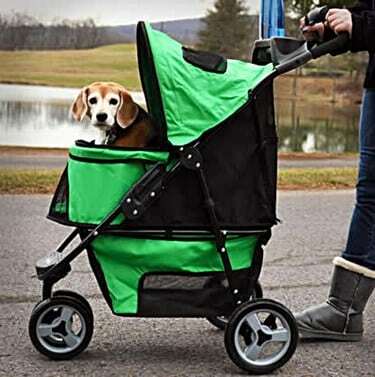 When you take your pet (it doesn’t have to be a dog) for a walk with the Gen7Pets Promenade Pet Stroller, you will both have an enjoyable time. In this review, we will tell you everything about the stroller, so you can make a more informed decision. We will tell you what it is made of, the good things as well as bad, and we will tell where you can buy one. We will also tell you about what other people are saying about it, including what they like about it and what they think could be improved. If you don’t have the time to read the whole review, click the link below to be taken straight to the site where you can buy this stroller for a price that you won’t believe. 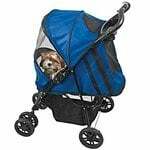 CLICK HERE to Read the Reviews from Other Buyers, and Buy the Gen7Pets Promenade Pet Stroller on Amazon! 1.4 What Are the Advantages & Disadvantages? You will no doubt be very impressed with this stroller. If strollers could be labeled luxury, like cars are, then this would definitely fit the bill. Gen7Pets has come up with an innovative design that not only pampers your pet but also makes walking so much more enjoyable for you. First of all, the way most strollers are made, you sometimes kick the bottom of it when you walk. This stroller has been made in such a way that you won’t run into that problem anymore. You can walk at your normal pace and not have to think about how far your feet are from the bottom of the stroller. You want your pet to be comfortable. And of course, very safe. The last thing you want is for your baby to be able to get out of the stroller. It is very roomy inside of the pet compartment, you can fit two small pets with no problems at all. The bottom is well padded, but you can always put another blanket in it, just for added comfort. It’s not essential, but it’s a useful option. 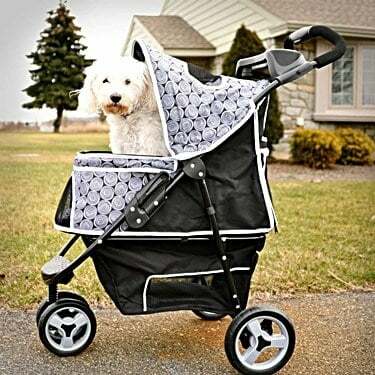 Another stroller that you may like is the Pet Gear NV Pet Stroller. It has bigger tires, which makes it easier when you go over broken or raised sidewalks a lot. A safety feature is actually for what you put in the basket underneath. It has a zippered closure, so none of your things will fall out when you’re walking. The manufacturer states that it can hold up to 50 pounds, but just to be on the safe side, you should put only put about 35-40 pounds in it. Consider the length of your pet, also. Check the inside measurements, and make sure that your pet will fit with a little room to spare. This can be one pet or a couple. That is if they don’t mind sharing. 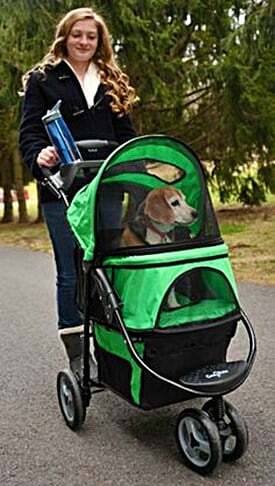 CLICK HERE to Buy the Gen7Pets Promenade Pet Stroller on Amazon! 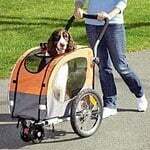 As far as the size of the pet compartment goes, this is one of the roomiest strollers you will find. It is well ventilated, also, with all mesh windows. It has a big front window, smaller bottom window, and a top window which is nice so that you can see your pet and they can see you. The size is 25″L x 13″W x 21.5″H”. The complete stroller size is 33.1 x 20.5 x 39.8 inches, and it weighs 16 pounds. The colors available for this stroller are Black Onyx and Spring Green. The Smart-Canopy mesh opens up and out of the way giving the pet more space when opened, unlike other strollers. Parent tray with 2 bottle holders and accessory tray. Inside pad can be removed and is for easy cleaning. There are not many cons at all for this stroller. People who have longer dogs, such as Dachshunds, find that their pet is comfortable, but is a little too long. Some owners unzip the front mesh so that their dog can fit better. Customers are pleased with the ease of opening and closing the stroller. Most are able to open and close it with one hand. There is a cup holder with a middle compartment included, which makes it nice because you can have your phone with you, as well as your keys, within easy reach.